Doris Day was born in 1922 – which makes her now 92 years old! Wow! Doris's first ever hit was Sentimental Journey (YouTube clip) in 1945. She also was in almost 40 films. The only one I can remember seeing was Calamity Jane. 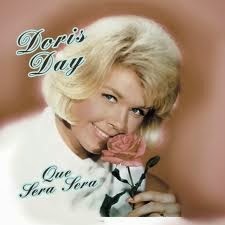 My favourite Doris Day song is Que Sera Sera (YouTube clip)– fabulous lyrics and tune. I also really love Perhaps, Perhaps, Perhaps (YouTube clip). Day is retired from the entertainment business but is still active in animal protection issues. She is wonderful! Love her movies and her voice. So much class. I love Sentimental Journey, my aunt use to play it on the guitar and her and grandma sing it. Thanks for the blast to the past! I remember my mom always sang Que Sera Sera when driving in the car when I was young. Gosh that would have been over 50 years ago.